Even the warm glow of Vero Wine Bar might be enough to soothe away the pains of Midtown, but it's a good start. Let's say you work in Midtown and you'd like to stop for a drink after work and you are not a member of a frat house. Up until last week your choices in the area were severely limited. Vero Wine Bar's new midtown location (which joins its UES spot, opened in 2002) is a welcome addition to the neighborhood. The wine bar is an oasis on a corner (2nd Ave at 52nd) so clogged with bars serving flat pints that anyone in the mood for something even slightly more sophisticated would hail a cab headed Uptown, or Downtown, or maybe Cleveland. To say Vero's drink menu is extensive would be like saying the economy has hit a tiny rough spot. The wine list is 100 strong (many of them quite reasonably priced), with a ridiculous 40 wines available by the glass. And the two-page specialty drink menu is nothing to sniff at either (mojitos to strawberry basil lemonade and a full page of martinis). Unlike the UES location, which offers small plates and bar snacks, this one has a full dinner menu in addition to panini (which are served gratis with a drink order on Mondays) and share plates such as standard antipasto and non-standard braised short rib tacos. The gnocchi with foi gras black truffle sauce is quickly becoming a house favorite. The warm and cozy spot, designed by Garrett Singer (Klee Brasserie, SoHo Park), welcomes diners with the glow of Edison bulbs hanging over a 40-year-old heart pine bar with a slate top. 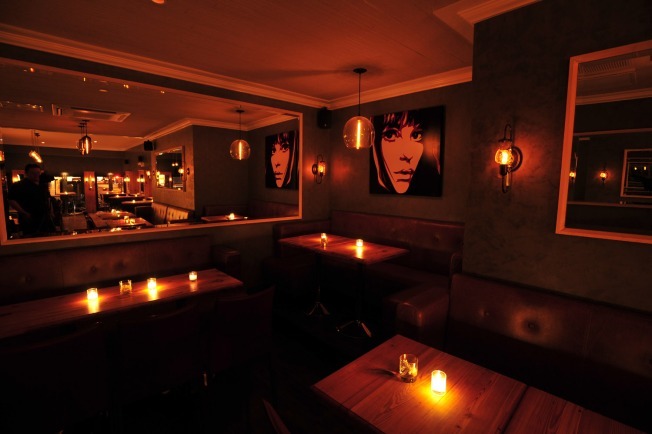 The lounge area, where you'll really feel like you are away from the Midtown mess, because you know, you can't see the street, is decked out with leather couches and monochromatic pop-art canvases of seventies' icons like John Travolta and Twiggy. While these touches might not surprise anyone in say SoHo, they are enough here to make you think you've stepped through some bizarre wormhole into another dimension.